As is my wont, I have left reading one of the most touted books of 2012 until now, long after any kind of hype has died down. I even put off seeing Gone Girl in the cinema because I don't like seeing the film adaptation before the original book. So after all that, was it worth the staunch praise, and can I say that suffering through Mr Turner was worth not having it spoiled? 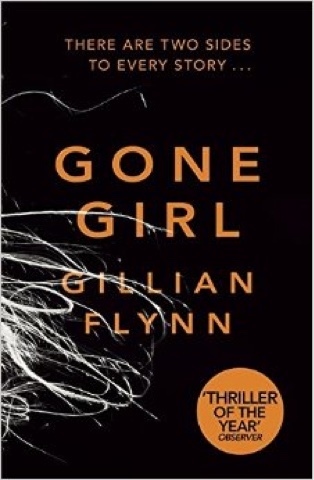 Gone Girl follows Nick Dunne, a former writer and current bar owner, on the day of his fifth wedding anniversary to Amy. He hasn't been looking forward to the day due to their marriage hitting a few bumps, but things look to get a lot worse when he goes home after work to find the door to his house wide open, signs of a struggle in the living room and Amy nowhere to be found. The police are soon involved and quickly find that maybe Nick and Amy's marriage isn't as rosy as he would like to present it as. This book is messed up in so many ways and I absolutely loved it. 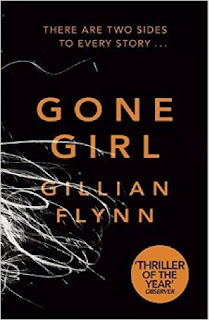 There isn't much I can really say plot-wise beyond the summary provided above for risk of spoilers, but I will say that it is really worth going into Gone Girl without any prior knowledge of the plot. The twists and turns are spoon-fed to the reader over the course of the narrative, so while there were several parts that I hadn't expected, it never felt like the revelation was unnatural or forced. The character development is similarly solid. Flynn has a real talent for balancing positive and negative qualities in characters, then bringing out certain elements in order to create a certain caricature depending on what the narrative needs. Only towards the end do you get a real grasp on what makes certain central characters tick. And it really explores just how far you can stretch a husband-wife dynamic before it stops being real.